Nowadays, keeping in touch with family and friends can be done in seconds. Whip out our phones and we can chat instantly via a hundred different apps pretty much anywhere, anytime we like. With that in mind, the thought of putting aside time to endure the inconvenience of even writing an email – never mind a letter – to a friend would seem, to many, a Herculean task worthy of a medal. In the 21st century, the act of writing something so long that isn’t a kind of business handover or Facebook profile bio just to connect with someone you love, not to mention the prospect of having to potentially wait days for a response, seems unnatural, unfathomable, and quite frankly unnecessary. A letter won’t function like, say, a Whatsapp conversation where replies to everything we write are instantaneous and inevitably shape and change the direction of the dialogue before we’ve quite finished what we’re even trying to say. Instead, you have to sit down and do a bit of personal reflection; think back to recent events in your life and wonder about those happening in the life of a friend. Just imagine... You receive a reply in the post after having poured your heart out in a letter to a friend days before. You tentatively tear open the envelope. You unfold the piece of paper within, and staring back at you is nothing but a giant, solitary, sad-faced emoticon. It’s a laughable thought, yet why we don’t bat an eyelid when that exact thing arrives to each of us every day in mobile format? The trap of developing a habit of detached insincerity when interacting with a screen can be all too easy to fall into. Recently, a close friend of mine moved away – not terribly far, but far enough to impact on how often we see each other. Before she left, we made a promise to become pen pals. Ever since then, an envelope arrives through the letterbox every once in a while to surprise me and never fails to brighten my day. It’s so meaningful to know that someone cares enough to put pen to paper, go out, buy a stamp, and track down a post box. A letter is such a delicate thing, but is so reassuringly real; it’s a physically tangible reminder of how important you are to somebody. And why does it have to stop at a simple letter? You could share that song lyric or line of poetry that’s been floating about your mind on repeat, doodle a little work of art; slip in a fallen autumn leaf from the garden that caught your eye or an old postcard you discovered of a place you love. 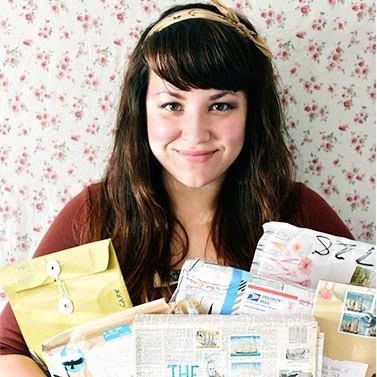 A unique art project, The Love Parcel, took life in late 2012, and is the creative brain child of Miranda Smith, who is on a one-woman mission to spread all the eponymous love she can through the humble medium of your local postman. The concept is simple. 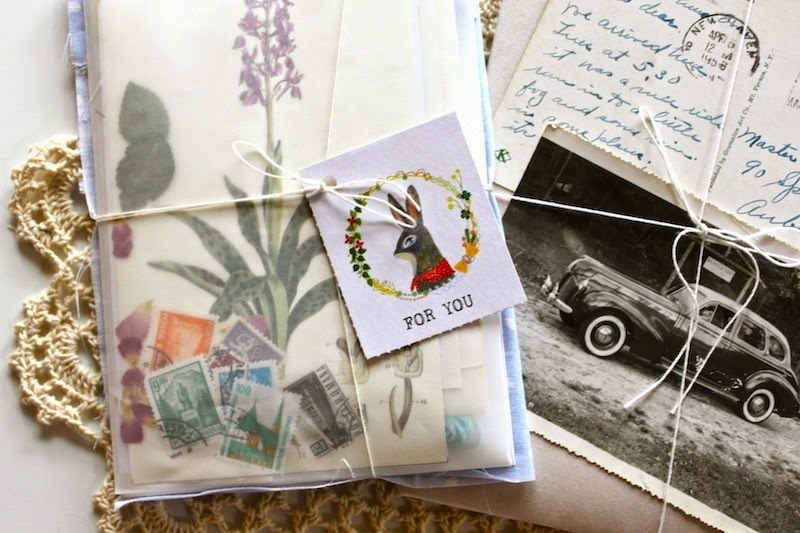 Make the effort to create a little package of captivating ephemera; send it off to Miranda at The Love Parcel HQ in Maryland, U.S.A; keep an eye on your post box and maybe sooner, maybe later, no matter where you are in the world, you’ll receive a special parcel that she has lovingly spent time putting together – just for you. No catch. No ulterior motives. Just a heartfelt, personal experience for its own sake shared with a stranger, all inspired by her memories of maintaining childhood friendships through being pen pals. Haven’t time to make something yourself, or just can’t bear the wait? You can purchase a readymade parcel or zine from her mini online shop, where any proceeds are channeled into keeping the project running. 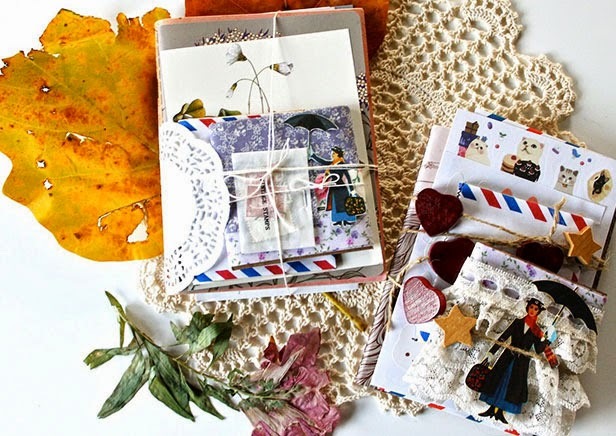 Miranda shares stunning pictures of the things she sends and receives on The Love Parcel Instagram feed, now with over 30,000 followers and counting, to encourage more and more people to join the snail mail revolution. It’s amazing how even the smallest effort can make the biggest smile, so why not ready those postage stamps and get #loveparceling to your nearest and dearest too?